While networks are widely thought to enhance regional innovative capability, there exist few longitudinal studies of their formation and evolution over time. 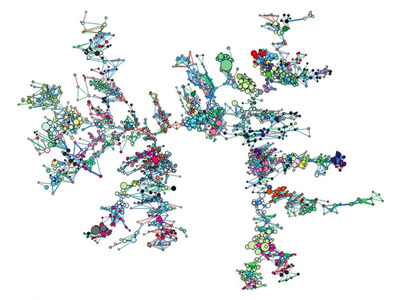 Based on an analysis of all patenting inventors in the U.S. from 1975 to 2002, the authors published a paper where they analyzed the evolution of inventor networks in the Silicon Valley and Boston regions. The first image represents the 7,244 Inventors in Silicon Valley's largest collaborative cluster in the mid-1990s. IBM's Almaden Valley Laboratory inventors (the tan nodes in the middle of the picture) provided the backbone for the network aggregation process that started in 1989. This process of linkage occurred as inventors moved from university to private employment and moved between firms, such as HP, Apple and Xerox. The second image illustrates the largest connected component of patented Boston inventors in the mid-1990s. The close-up illustrates the centrality of MIT, indicated by the light orange nodes, in the Boston networks. Each of the nodes illustrates an inventor. The color corresponds to the inventor's organization and the size of the node corresponds to the importance of the inventions (as measured by the number of prior citations from future patents). A tie corresponds to co-authorship of a patent and its width indicates the number of collaborations. Red ties are old, blue ties are recent, and green ties are most recent. 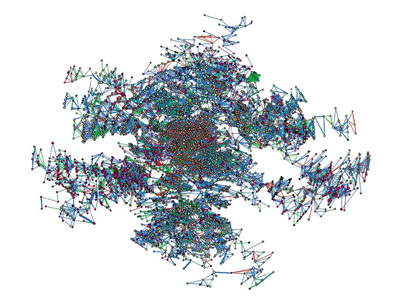 The close-up illustrates the centrality of MIT, indicated by the light orange nodes, in the Boston networks.